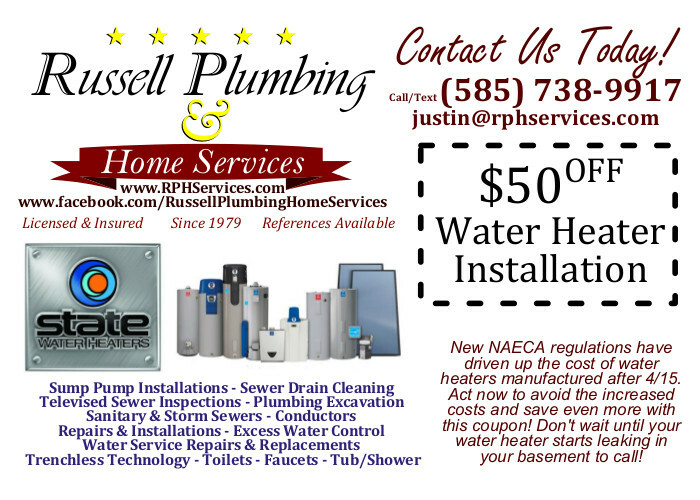 We at Russell Plumbing & Home Services would be more than happy to take your call, text, email or Facebook message to help resolve any plumbing or excessive water issues you may be having. Contact us to set up an appointment for a free consultation or estimate to get you back on track to a worry free solution! We’re a father and son company that has been working in the Rochester community and surrounding areas for over 30 years with experience totaling over 55 years. In addition to solving traditional plumbing issues, such as leaking pipes or plugged drain lines, we also specialize in excess water solutions as well as excavation. If you have a unique plumbing situation or an odd job and you’re unsure whom to contact, call the professionals at Russell Plumbing & Home Services–no job is too big or small. With experience in many areas of home service & repairs, you can count on Russell Plumbing & Home Services to treat you and your home right.